These Apple Pie Medallions are yet another variation of my coconut cookies. They are light and moist and taste like apple pie! Especially when you get a bite of apple. Peel and core apple. Saute in 1 Tablespoon of coconut oil [affiliate link] over medium heat for 11 minutes or until soft and lightly browned. Stir frequently. Sift the coconut flour [affiliate link] to remove any lumps. Measure one half cup of coconut flour and go ahead and pat it down (you don't want it to measure fluffy just from sifting or you will have much less flour than in my recipe), and use a knife to scrape across the top of the measuring cup. I have learned with coconut flour you really need to get precise measurements (I should begin weighing for best accuracy). Add to a medium sized mixing bowl. Add the remaining ingredients (except for the apples) into the bowl with the coconut flour. Use a mixer and blend until thoroughly mixed. Allow to set five minutes so that coconut flour can absorb the moisture. Once again this is a very moist batter. Add the sauteed apples to the batter and mix. Drop by measured tablespoons onto a greased cookie sheet. Oil your fingers with coconut oil and lightly pat each dropped shape into a small round cookie. Bake for 10 minutes, or until cookies lose their shiny appearance and are firm to the touch. This post was shared at Fat Tuesday on May 14th, 2012. These are my new measuring scoops: Good Cook 4-Piece Measuring Scoop Set. 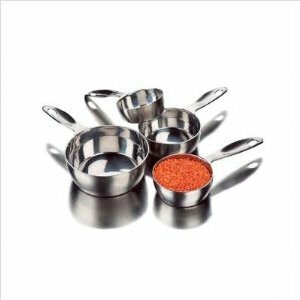 Unfortunately, I'm not the only one that likes to use my nice stainless steel measuring cups… my sons think they are dipping bowls or drinking vessels since when it's time for me to cook I am rarely able to locate the entire set. I'm hoping these scoops will not be as tempting as the stainless steel ones have been. Saute in 1 Tablespoon of coconut oil over medium heat for 11 minutes or until soft and lightly browned. Sift the coconut flour to remove any lumps. Measure one half cup of coconut flour and go ahead and pat it down (you don't want it to measure fluffy just from sifting or you will have much less flour than in my recipe), and use a knife to scrape across the top of the measuring cup. Add to a medium sized mixing bowl. Add the remaining ingredients (except for the apples) into the bowl with the coconut flour. Use a mixer and blend until thoroughly mixed. Allow to sit five minutes so that coconut flour can absorb the moisture. Once again this is a very moist batter. Categories: Cookies, Dessert, GAPS Diet Recipes Tags: apples, coconut flour, coconut oil, eggs, honey | 11 comments - be the next! I don’t usually buy coconut flour, so would sprouted whole wheat flour work? Would I still need to sift it. Also, I’m not on the GAPS diet, just trying to find healthy cookies, treats for granddaughter and I to make. These are really delicious thanks Starlene. Shelley, thanks for reporting back on your success with using half as much honey. This is always of interest to me so I appreciate your feedback. doubled the vanilla, cinnamon, nutmeg. Cookies were still complete mush after 10 minutes. I lost track of just how long they cooked for, but it was at somewhere in the 20 minute range. They were yummy! My 8 year old daughter loved them too. I can see a lot of possibilities with this recipe with using other fruits such as peaches or pears. Even the batter is good. I only got 2 dozen cookies because somehow the last few spoon fulls I scraped from the sides of the bowl wound up in my mouth instead of on the cookie sheet. Don’t know how that happened. Oh, and somehow the rating information would only let me fill in 4 stars. I couldn’t get the 5th star filled in.